Still relatively untouched by modern life, the country offers visitors a true look into life off the grid, but a slowly growing number of tour providers are making it easier to navigate the vast wilderness. Travelers often overlook Mongolia for its bustling neighbors, China and Russia. 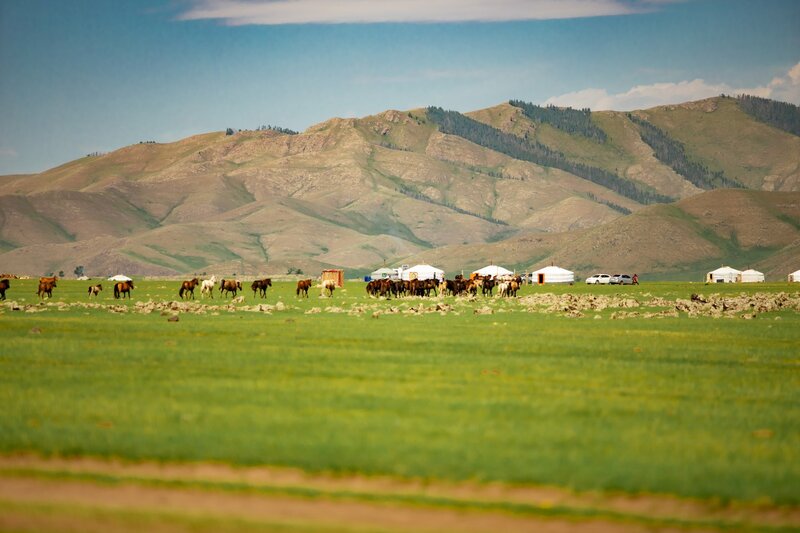 But in Mongolia—one of the world’s most sparsely populated countries—by venturing into the wild with epic horse rides through the valleys, climbing up to Buddhist villages and temples, hiking through the mountains, luxurious yurt stays under a canvas of stars, and homey dishes that are truly farm to table, one finds the perfect antidote to the intensity of, say, Shanghai or Moscow. Still relatively untouched by modern life, the country offers visitors a true look into life off the grid, but a slowly growing number of tour providers are making it easier to navigate the vast wilderness. Here, nine reasons to visit that will quickly catapult Mongolia to the top of your bucket list. One of the largest deserts in the world, the vast Gobi Desert encompasses much of northern China and southern Mongolia. 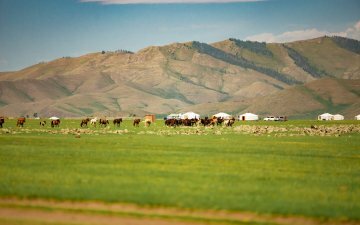 Bordered by the staggering Altai Mountains and the vast grasslands of northern Mongolia, the views you get from atop a camel or standing on a towering sand dune will vary depending entirely on which way you look. Like the deserts of North Africa or the Middle East, the Gobi offers a range of unique ways to explore its rolling and endless horizon—via camelback, in a 4x4 Jeep, or by foot. However, once you get there, spend a few hours climbing to the top of the Khongor sand dunes, which offer panoramic views of the expansive desert. Also, be sure to explore the dinosaur remains petrified in Bayanzag. Excavated in 1922, it’s one of the only places besides North America where fossils are still being discovered. Few places in the world have the rich, albeit complicated, history of Mongolia—ranging from the imperialist reign of Genghis Khan to the intertwined Communist rule. Khan’s kingdom once stretched from the edges of Eastern China to Persia, and he is still remembered as one of Mongolia’s fiercest warriors. Today, his likeness is used on everything from vodka to hotels, but more noble tributes exist as well, like a staggering 130-foot-tall statue of him on horseback on the banks of the Tuul River or a museum at his birthplace of Dadal (in Mongolia’s northeast Khentii region). Nearly 100 years after the Mongolian Revolution, which led to Communist rule in Mongolia, the country still bears vestiges of its political past. The buildings in the capital city of Ulaanbaatar feature the gray and concrete facades associated with Soviet architecture, and the museums, such as the Victims of Political Persecution Museum—dedicated to those who fell prey to the purges of the era—are stark reminders of that period. Even though much of the older generation still reveres their Communist roots, many of the younger residents focus on the democratic future of their country. With the ever-changing terrain, the nearly constant blue skies, and the incredibly beautiful landscapes, most people are flocking to the wilds of Mongolia for the chance of some heart-pumping adventure. From climbing up the steep and craggy terrain of Bogd Khan Mountain to hiking around the crystal blue Ugii Lake, and horseback riding from Ulaanbaatar to the majestic Orkhon waterfall, there are plenty of ways to experience the rugged Mongolian countryside. For those truly serious about seeing the most remote parts of the country, there’s the annual 100-mile trek through the Altai Mountains that follows the movements of the hundreds of Kazakhs who brave the minus-25-degree temperatures to reach western Mongolia. The Kazakhs, who are mostly hunters, gatherers, and farmers, brave the harsh climate every spring in order to gather food and herd their animals. It’s free to camp throughout Mongolia, but experts recommend doing plenty of research before plotting your course and making sure you are thoroughly outfitted—you can easily go for days without seeing another person (especially a person who speaks and understands English). Another alternative to tent camping is to seek out one of the country’s many yurt campsites, which often feature luxurious amenities like saunas, heated tents, warm handmade yak blankets, and even rain showers. Many of these campsites also offer activities, from sunrise horseback rides around the mountains to archery lessons. When most people think of Mongolia, there’s a strong chance the culinary scene doesn’t come to mind. The capital of Ulaanbaatar has quite a global array on offer, from North Indian to Mediterranean fare (and global chains like KFC), but outside of the city is where you’ll find the true cuisine of the country. Most villagers live on sheep’s milk, sheep’s cheese, and mutton (ask for the mutton fried and served with buttery dumplings known as buuz, or with the flaky khuushuur pastries), though camels, yaks, goats, and horses are other common sources of protein. You’ll also find hearty stews (tsuivan) with mutton and even noodle dishes that reflect a bit of Chinese culinary influence. However, don’t expect many fresh vegetables—the rural people of Mongolia need as much animal protein and starchy carbs as they can to withstand the freezing winters. With one of the lowest population densities in the world, most of Mongolia is comprised of nearly pristine natural landscapes. Imagine endless untouched space punctuated only by an occasional hut or herd of sheep. Not only that, but the landscape is incredibly varied: the sand dunes of the Gobi desert; rolling grasslands that make up more than half of the country’s terrain; soaring Altai Mountains; thick forests of northern Mongolia; and beautiful lakes, like Khövsgöl Nuur, which give the country 65 percent of its freshwater. Due to the country’s extremely harsh winters (temperatures can dip well below minus-25 degrees) and relatively remote and unchartered landscape, most tourists opt for neighboring Russia and China, and even Nepal. However, with more flights being offered from the U.S. to Ulaanbaatar, and more adventure tour groups, like Intrepid, sponsoring backpacking trips around the country, it won’t be long before this unchartered land becomes the next place to be. So book a ticket, a tour, or a trek as early as you can in 2017 to enjoy the unspoiled landscapes before the rest of the world figures them out. Despite the country’s Communist past, more than half of the residents are proudly Buddhist. The most important Buddhist site in the country is the Erdene Zuu Monastery, which was built from the rubble of Genghis Khan’s former headquarters and now sits near the center of Kharkhorin. In the capital, don’t miss a visit to Buddha Park or the Gandan Monastery. It’s easy to find a deep sense of calm not just at the monasteries themselves but also from the humbling vistas that surround them. One of the best ways to soak up the country’s history and culture is to visit during the annual Naadam festival, which takes place every July. It combines some of the most important and traditional aspects of Mongolian culture, from wrestling competitions and horse races to cultural performances and culinary offerings. The country also celebrates its New Year with parties and feasts.